Can't be stolen by Stygian Eye either, amongst other Relic shenanigans. True, I don't see it as an anti-card for targeted wounding (like khopesh). But the chance of losing combat struggles is big, right? This is an awesome defender. Sure, commit with lots of terror and combat. I'll make sure to commit with this guy, lose combat and wound something from you. For me, this is a new auto-include. The 3 cost slot for ST decks is going to be a problem. The fact he is immune to khopesh basically is good. Also, yes your opponent has to be afraid where commit characters because he can redirect if lose combat struggle. Use "Small price to pay" to turn one enemy insane and wound the other! Nevermind, it's different as small price to pay has the wounding go second. Should work. mnBroncos - 5 out of 5. It is amazing how good this guy is for only 3 cost. Will see play in every Silver Twilight deck. Obtuse - 5 out 5. If you like Silver Twilight you just got a whopper of a character. If you love A Small Price to Pay, you just got a new card to pull off a devastating combo with. Mr. Elegant and Elusive here is bullyproof at stories and is just plain mean. A card your opponent will likely need to find an answer for when he hits the board. livingend - 5 out of 5. May God have mercy on your soul, if you don’t have removal in your hand when Lindquist hits the board. Playing around this fancy bloke is almost impossible, meaning you’d basically have to tie every combat struggle he decides to show up for. Verdict: For a character to still find room in Silver Twilight’s superbly supplied three cost slot speaks for itself. WWDrakey & Ire - 5 out of 5. And here we thought design was trying to make Terror more of a thing by avoiding giving Willpower to new high-impact characters. Enter August Lindquist, the man we’ll see ST running 2-3x alongside BRB for the foreseeable future. This guy… is just bonkers, all-out, undeniable goodness in an elegant and elusive package. Big silly sword, beware! "then force a stone calendar into the deck to remove fate tokens for infinite happyness"
Stone Calender has now be Erattaed to only remove Story Success Tokens. If you use him as a target for pervasive toxemia, can you use his ability and still commit to a story? There is a rules thread that talks about this, but the summary is that you can target him, and trigger his ability, but if you redirect the wound to an opponent's character then you haven't paid the additional cost of committing, and thus don't get to go to the stories. This guy seems overpowered to me. He's not loyal or steadfast so every serious deck is going to include a few ST characters now. Compare with Core Set Military Advisor who costs 4, has fewer icons, takes the wound (Toughness +2 vs August's Fated 3) and has to pay 2 to wound. An ST splash is attractive due to powerhouse cards like this, but many deck archetypes just don't have room for it. At the last official Australian nationals this card was barely played and I expect a majority of the decks there qualified as serious. The other problem is you could probably make the same claim about San Marco Basilica, Y'Golonac, Faceless Abductor, Dutch Courage, and so on. Can't splash them all. I don't have any tournament experience - I've only watched some of the Championship matches on YouTube - but personally I'd seek to do as little splashing as possible. I think a deck with a unified engine beats a toolbox deck 9 out of 10. That said, if my deck engine featured a lot of self-wounding (Pervasive Toxemia, Baka, etc. 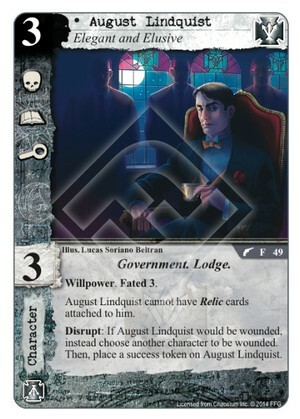 ), I just might see if I could sneak 12-15 ST cards in there because August Lindquist and B. Ramsdale Brown would be a great fit with what I'm already trying to do. Fair point, Yes. And Tom Caopr's Y-Train 3.0 winning deck https://www.fantasyf...all-of-cthulhu/ didn't have ST characters. I still don't like this guy though. Thematically inexplicable and devastating against wounders. .